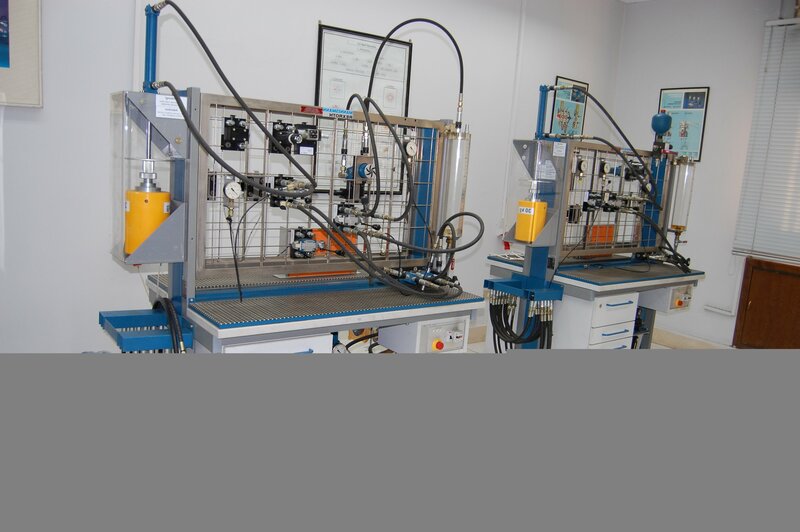 Hydraulic Systems Lab provides training on hydraulic circuits using real movable components which enable the trainee to operate hydraulic circuits similar to the real systems. In addition, the trainee will be able to measure different variables, and detect faults. PTI has units from the real parts which help the trainee to understand the function of making different valves and pumps using the computer aided training. -Refrigeration and Air Conditioning Lab. The trainee becomes acquainted with the components of Refrigeration and Air Conditioning systems by viewing real models. These models contain electrical and mechanical parts and connections which enable the trainee to find, test and repair faults. In addition, the trainee will get training on the basic skills (pipe cutting and welding, refrigerant charging and system maintenance). PTI also has a Reefer with control system for operation and hands on training. Generators and Electric Equipment Lab contains samples for generators, Transformers, controlling systems for single and three phase motors, meters and fault detection. All these facilities provide the trainee with hands on training concerning maintenance and repair of various Electrical machines.